He’s just published his 20th novel. This would be an amazing feat if he were only 71 years of age. It would be a spectacular achievement if he were a man of 81. But Herbert is 91 years old. Which adjectives exist to describe this accomplishment? “I’m pretty sure I’m the only writer who’s publishing a novel this year at this age,” he laughed when I saw him at his San Francisco apartment recently. Herb and I go back a few years now. 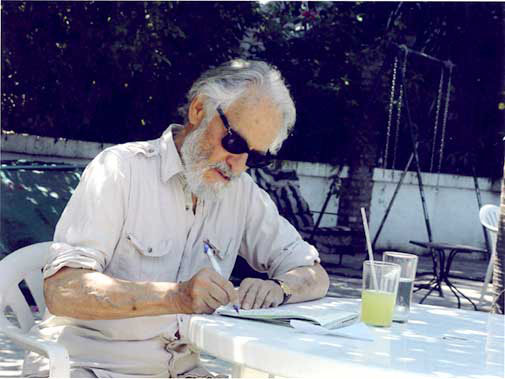 He is among a number of older writers thatI have befriended — Wallace Stegner and Harriet Doerr among them. Herb thought I might be interested in selling some of the letters he’s kept over the years from writers such as Saul Bellow, William Kotzwinkle, William Saroyan, Even Connell, Elmore Leonard, Kurt Vonnegut, among many others. Indeed. I am more than interested. 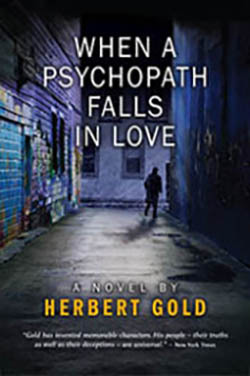 I’ll sell a few books for him, too, but I was delighted to hear that a Portland, Oregon publisher, Jorvik Press, recently published Herb’s 20th novel, When A Pyschopath Falls in Love. Herb looked as handsome as ever with a bit of mischief in those 91-year-old eyes. He can’t weigh more than a buck fifty, but he’s not frail, despite having a recent hip replacement. He doesn’t even use his cane. He still has a pretty good head of hair, a sly smile, a gray beard. He moves about his San Francisco apartment with a great view of the Bay Bridge with alacrity. It’s a much better word than spry, a word we use to describe old people. Herb may be 91, but he ain’t old. He looks at least a decade younger than his actual age. Herb was born March 9, 1924 in the Paris of Ohio, also known as Cleveland, to a Jewish family. He moved to New York at age 17 after selling some of his poems to literary magazines. He studied philosophy there at Columbia where he struck up a friendship with Allen Ginsberg. He later won a Fulbright scholarship and moved to Paris where he finished his first novel. Subsequently he moved as he wrote, often traveling to Haiti, sometimes hitch-hiking all over the United States. 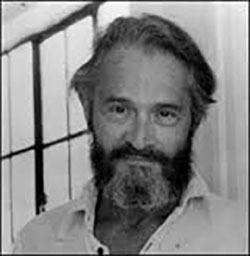 Eventually he came to San Francisco, his home of more than a half century, just as the Beat Generation was giving way to the hippies and the turbulent and wonderful ’60s. He’s been a fixture in the San Francisco literary scene ever since. He counts Birth of a Hero, The Man Who Was Not With It, Fathers, and Salt among his best-known works, and he’s written a few memoirs, too, such as My Last Two Thousand Years, Not Dead Yet, and Still Alive!, which he subtitled A Temporary Condition. The man is as funny as he is hip. And he makes a mean cup of green tea, if you’re lucky enough to spend some time with him. His papers are now housed at the Bancroft Library at the University of California, Berkeley. I can hardly wait for the next time I see him, and especially to call him a year from now to honor his 92nd birthday — and to see what he’s going to publish next.